Allie Levy ’11 recently signed a lease to occupy 2,678 square feet on the first floor of the former Dartmouth Bookstore location. The space will transform into Still North Books & Bar — a bookstore, café and bar fused into one — and open in fall 2019. The building’s managing trustee Jay Campion plans to renovate the rest of the building and create office and retail space. The new bookstore will hold 7,000 to 10,000 volumes, spanning from literary fiction and narrative non-fiction to cookbooks, according to Levy. “It’s important to me that the inventory reflects the tastes of the community,” she said. Levy added that Still North Books & Bar will maintain a web portal for online ordering to ensure community members’ needs are met. She said the store will remain open until 10 p.m., as she hopes for the space to become a hotbed of activity in downtown Hanover. Levy said she plans to provide ample seating and community-oriented programming such as poetry readings, author visits and student a cappella performances. The beer and wine bar will serve tapas-style dishes with an emphasis on locally-sourced ingredients. Levy said she also hopes to offer a limited cocktail menu after the store’s opening. Levy derived the name of the bookstore from the College’s alma mater, yet purposely avoided direct mentions of Dartmouth, she said. Since graduating from the College in 2011, Levy has gained extensive experience in book publishing and independent bookstore management. She previously worked in the marketing department of publishing company Houghton Mifflin Harcourt and as an events coordinator at Denver’s BookBar. She said her time at BookBar largely inspired the creation of Still North Books & Bar. She noted that BookBar’s bar and café attracted community members and helped foster a thriving social scene within the traditional bookstore setting. Still North Books & Bar’s model will emulate Campion’s vision of brick-and-mortar retail in the era of Amazon. Campion said he leased the space to Levy because her model “[replicates] something that is successful elsewhere.” He added that the budding market for independent book retailers promises the sustenance of physical bookstores, especially within Hanover. Government professor Herschel Nachlis, who expressed his dismay at the Dartmouth Bookstore’s closure when the news initially broke last year, said he was enthused to learn of Still North Books & Bar’s opening in the fall. Levy, an English major, said she had always wanted to expand the independent bookstore model to Hanover, but felt discouraged by the presence of the Dartmouth Bookstore. She decided to pursue her dream after she heard the Dartmouth Bookstore was closing. Seeking guidance and rallying support for her cause, Levy said she contacted English professors at the College. She said English professor Alexander Chee, whom Levy had met through her time at Houghton Mifflin Harcourt, was instrumental in the establishment of Still North Books & Bar. Chee said he and Levy collaborated to create a crowd-funding campaign on indiegogo.com. The campaign, which aspires to raise at least $100,000, will allow community members to contribute toward the expenses of stocking books at Still North Books & Bar. Levy added that she will finance additional startup costs, like rent and utilities, through bank loans and personal funds. Levy noted that the number of U.S. independent bookstores grew by 35 percent between 2009 and 2015. She said she hopes her crowd-funding campaign will alleviate the burdensome expenses associated with independent bookstores that often preclude further growth. 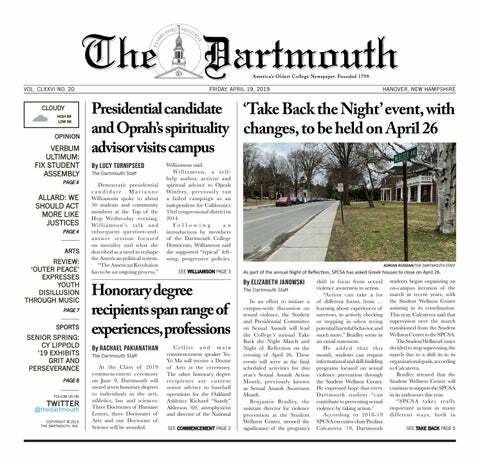 Hanover town manager Julia Griffin emphasized that Dartmouth students play an important role in sustaining local businesses such as the new bookstore. Levy is a former member of The Dartmouth Senior Staff.